When did bow hunting become part of your life? Were you out with your Dad shooting a long bow? Intrigued by the idea of bagging an animal using nothing but your wits and skills? I admit to both and I'm eager to pass along my passion for this sport to my kids and to share experiences with friends-even though not all of them are on the same page! I'm addicted to gear. After all, being properly equipped is about safety and comfort, too. From the right clothing to knowing where I can hunt, I had to learn my way around this sport the hard way: by making a few mistakes. To help you avoid mistakes, I've scoped out 7 ladder stands for your review. In pursuit of what the U.S. Department of Natural Resource's Kevin Wallenfang comically refers to as "horn", you'll find a variety of styles, prices and perks in this selection. One of them may have your name written all over it. Proving that you don't have to spend a fortune to get a product that serves your purpose when you hunt, I found the Ameristep 15-foot, two-man ladder stand, and it costs less than $100. It's adequate for a day of enjoyment and weighs only 65 pounds. This isn't the tallest stand in our review, but when you and a buddy carry it into the woods, it assembles quickly. -The shooting rail and seat are lightly padded. -Footings are designed for stability; won't sink into the forest floor once installed. -You can purchase a custom-fitted hunting tree stand blind and umbrella to match. -Solid construction supports big men comfortably. -Powder-coated finish for long-life in all kinds of weather. -Comes with hardware plus plastic washers to secure in place. -Great product for the price; highly-rated by hunters. 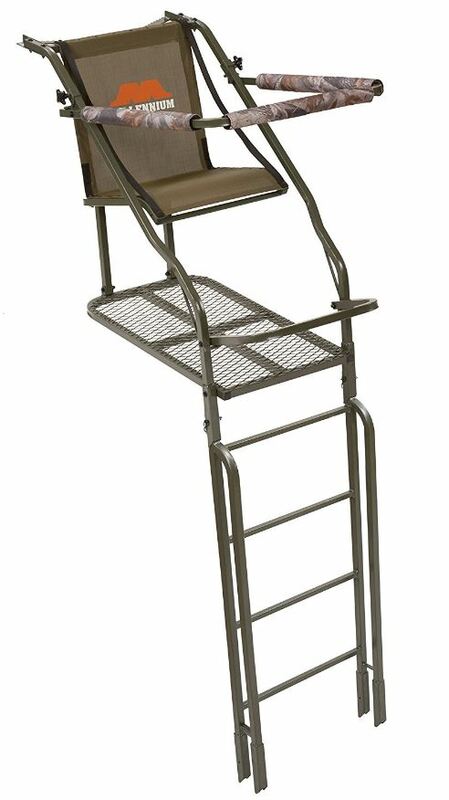 -Despite its light weight, this ladder stand doesn't fold down for transport. -Omit the ladder section so the stand is shorter, and you'll need additional tree support straps. -Not every owner trusted the assembly kit's ratchet straps and added their own. -You may not be able to install this stand without help. -Thanks to tight seals, you won't have to worry about game-scaring noise. -Lots of room to operate, especially with the safety bar down. -Easy to assemble and set up. -Ameristep is known for excellent customer service. -Erect the ladder stand without extra ratchet straps and it could wobble. -Bring extra rope along; the one that connects to the support could be inadequate. -Despite company claims, tall and hefty men may not enjoy much maneuverability. -Has no structural "back brace" to stabilize this product. Either a single bow hunting enthusiast or two guys on the same hunting page. You'll pay more for the X-Stand Duke Ladder Stand than you would for the aforementioned Ameristep model, but in return, you get more features and benefits. Weighing a hefty 79 pounds, you could need wheels to get this stand to its destination because it's solid steel and built for the long haul. Comes with a 4-pt. safety harness. You even get a complimentary drink holder and two accessory hooks for whatever you want to hang. 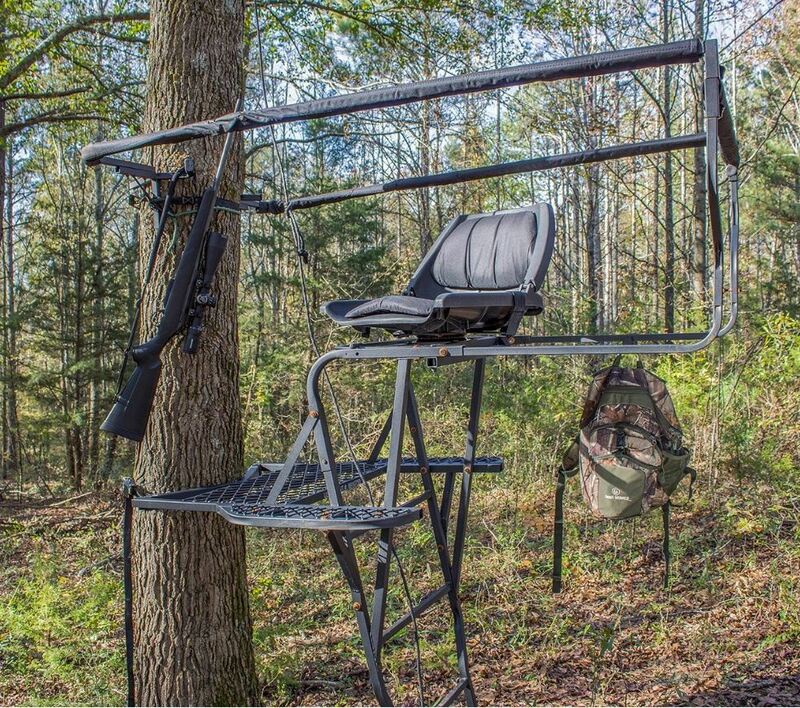 -At 20-feet tall, this ladder stand gets you into a higher shooting position. -Engineered with a revolutionary Safety System. -Comfort-fleX seat flips up for full platform use. -Padded arm and foot rests offer comfort during extended stays. -Duke Shooting rail can be flipped or removed at any time. -Self-lubricating nylon washers eliminate metal-to-metal contact. -A taller ladder means better shooting vantage points. -The signature Safety System ensures security even before you climb. -Flip the seat and rail at any time for full platform access. -The Duke is meant to be used by just one person. -Weight may make one-personal transport and assembly difficult. -Comes in black rather than camouflage or neutral colors. -Grip system could get in the way and trigger safety issues. -HeliX oval tubing not only impacts strength but lessens noise. -Self-lubricating washers are essential to stealthy use. -Powder-coated "Weather Defender" protection also lessens noise. -Platform size is a roomy 18-inches wide by 26-inches deep. -May be priced beyond your budget. -You'll have to hunt alone given the size and design of this ladder stand. -Assembly is time-consuming; especially on your own. -May be too tall or too short for your environment. A single bow hunter seeking peace, tranquility and beers rather than company. Despite the fact that this single seater comes with a price tag that's three times that of the aforementioned Ameristep set-up, you may not mind paying extra for this single ladder stand with folding seat that elevates you 21-feet into the tree canopy. Holds one person weighing up to 300 pounds. Sound like you? -Ultra-strong welded steel construction with double rail ladder for safety. -Powder-coat finish holds up under extreme weather situations. -Rail and arm rests feature adjustable padding for maximum comfort. -Use the folding foot rest when relaxing in-between the action. -Relax to the max in the patented, foldable, contoured Tight Sling seat. -The safe link line is solid and dependable. 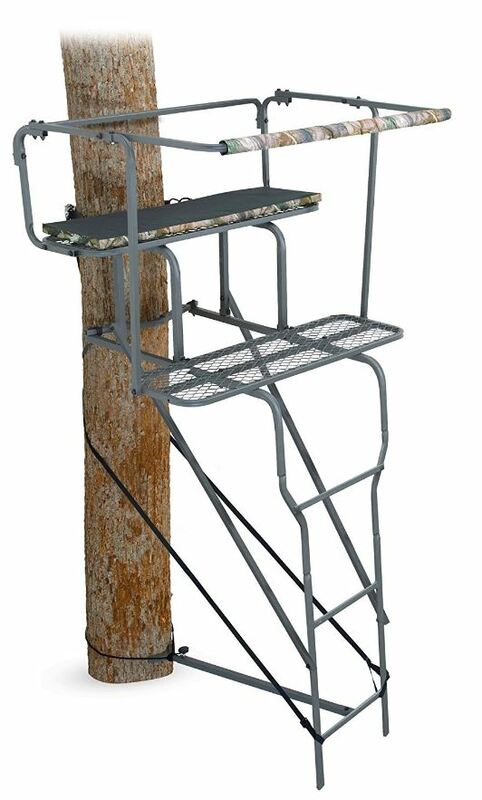 -Adjustable brace and stabilizing strap hold ladder stand tightly to tree. -Platform size is 20-inches wide by 32-inches deep. -Seat size is a roomy 20-inches wide by 17-inches deep. -Gets you 21-feet above the forest floor for a better shot. -This ladder stand weighs 92 pounds, so transporting it is cumbersome. -I'd need 2 or 3 people to help with assembly and install. -There is no lower bracket extending from the platform base to the tree. -You may have to address ground-to-platform structural weakness issues. -Tan color and camo pattern blend into the environment. -Adjustable shooting rail for stability and accuracy. -Oversize standing platform that's obstacle free when seat folds back. -Meets or exceeds TMA industry standards for product quality. -Could stretch your equipment budget too far despite zero noise and wiggle. -No support rod about 1/3 of the way from the ground up. -Due to its heavy weight, this ladder stand isn't very portable. -You could find a kink in the seat strap bolted to the unit. -A single bow hunter with deep pockets and enough muscle to erect it. For just a few bucks more (pun intended) than the aforementioned Millennium, you can invite a friend to share the day with you because this shooting platform really is big enough to spread out when one isn't visually stalking game or snagging it. The manufacturer calls this a Tower Tree Stand for a reason. Buy it and you'll feel like a king overseeing your domain. -Fabricated of sturdy steel that promises years of solid use. -Padded 360-degree swivel seats for hours of comfort. 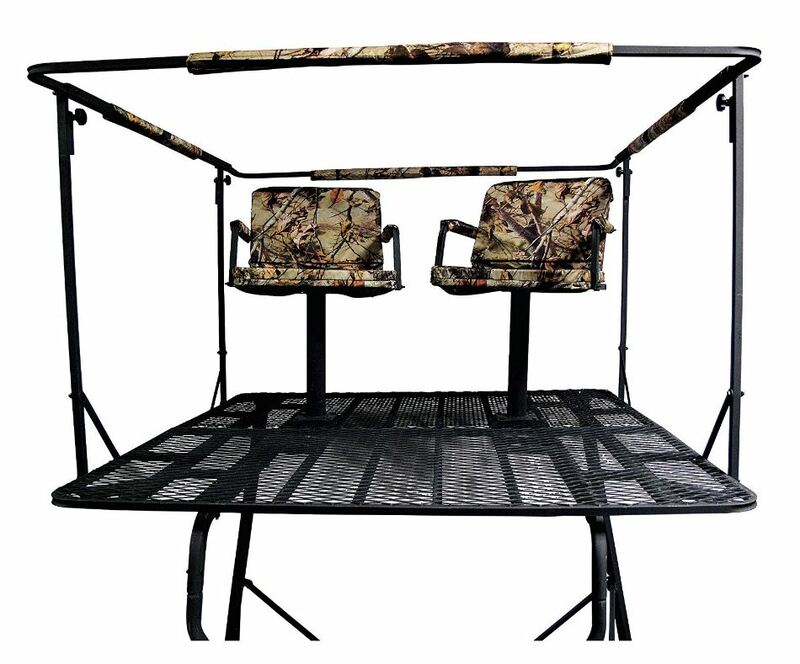 -The 4-sided shooting rail (36-inches tall) is padded with camouflage-covered all-weather textile. -Ascend or descend from a roomy 20-inch-wide ladder. -Custom footpads secure the platform to the ground so it won't sink. -Use it with or without a full enclosure blind (not included). -The platform dimensions are impressive: 57.5- x 57-inches of solid steel. -Each chair features a 16-inch backrest and 18- x 12-inch seat. -Because seats are 20-inches high, your visual perspective is enhanced. -The price isn't prohibitive; you get a lot for your money. -It can't be mounted in a tree due to its unique configuration. -At a weight of 145-pounds, transport and assembly will require additional hands. -Weight capacity is 500 pounds; if dudes weigh 250 pounds each, go light on the gear you bring. -You might feel more comfortable on a platform with 4 rather than 3 legs. -A unique design improvement over the traditional ladder stand model. -Bring along a friend--this product actually has enough room to stretch out. -Convert the two seats to a bench with back by putting a board under the cushions. -You might not find a comparable product for the price. -Once bolted in place, you can't move the chairs. -This rig could use the help of an engineer; assembly instructions are complicated. -You may not consider the seats to be practical when operating out of a blind. -Weighing friends might be mandatory to make that 500 pound weight cut! Best buddies who share a passion for bow hunting that requires the ultimate ladder stand. 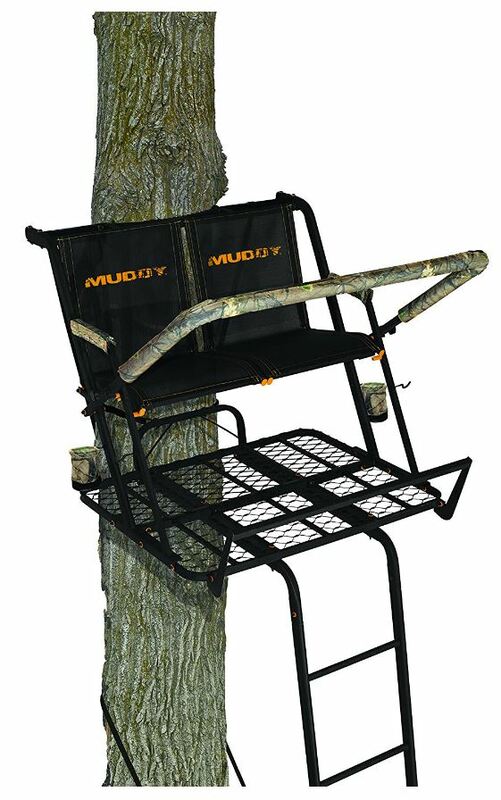 You won't be able to nap if you add the Muddy Nexus 2-man Ladder stand to your hunting gear arsenal, but the spacious chair adjusts to 6 different positions, so you get a relaxed lay of the land from your perch. The operative word is "flip" if you choose this ladder stand: just about everything folds up to maximize standing space. -The seat, foot rest and shooting rail all flip back. -Both the rail and arms are padded for comfort. -Large, comfortable seat (39- x 17-inches) accommodates two shooters. -4 sturdy, single-rail sections connect for access to platform. -The platform is 42-inches wide and 34-inches deep. -TrakLOCK system for safety and stability. -Buffer tube eliminates vertical and horizontal stock movement. -Good value for the price and ability to host 2 men. -It's not a one-man assembly operation at 116 pounds. -Users say it can be hard to get up on the tree due to its taller height. -It's wise to buy the company's installation hoist so the base anchors properly. -Don't plan to move this ladder stand. It's designed for permanent installation. -Manufactured of reinforced polymer; DuPont extreme temperature glass. -All mounting hardware is included. -Features both tall and short adjustable cheek rest features. -Requires due diligence when erecting because it is so top heavy. -Could take between 3 and 4 men to assemble properly. -Consumers have received bent ladder pieces, either due to QC or ship issues. -This product is made in China, despite claims to the contrary. -Guys who seek a relatively affordable, permanent installation with lots of fold-down features. 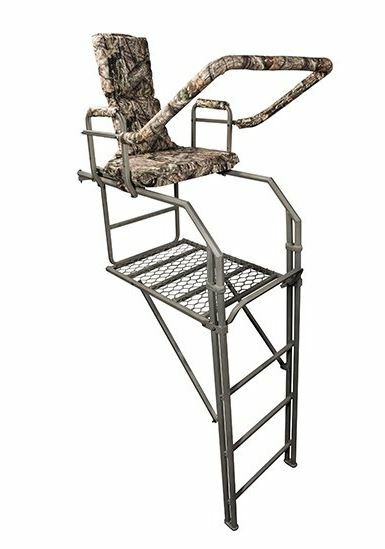 It's not the priciest ladder stand on our list and both hunters and reviewers are favorably impressed with this product, so it deserves your consideration. If sales are any indication of its popularity, the Summit Tree stands Hex Ladder Stand sells out quickly, so if you decide this stand is for you, don't put off your buying decision too long or they may be gone. -Extra tall steel ladder measures 20.5 feet. -Foam-padded seat with backrest is solid and comfortable. -Fixed, double shooting rail comes with positive lock connections and quick-disconnect bolts. -Comes with a camo buckle safety strap and 2 ratcheted crisscross straps for stability. -Platform measures 23.5- x 31.5 inches; seat size is 22.75 x 16.5. -Summit has been engineering high-quality tree stands for 35 years. -Crafted of aerospace-caliber hexagonal steel tubing. -Ladder offers Summit's exclusive double-railed and Positive Lock system. -Safety features: platform is slip-resistant; comes with buckle platform strap and 2 ratcheted straps. -Product weighs 115 pounds; assembly requires extra labor. 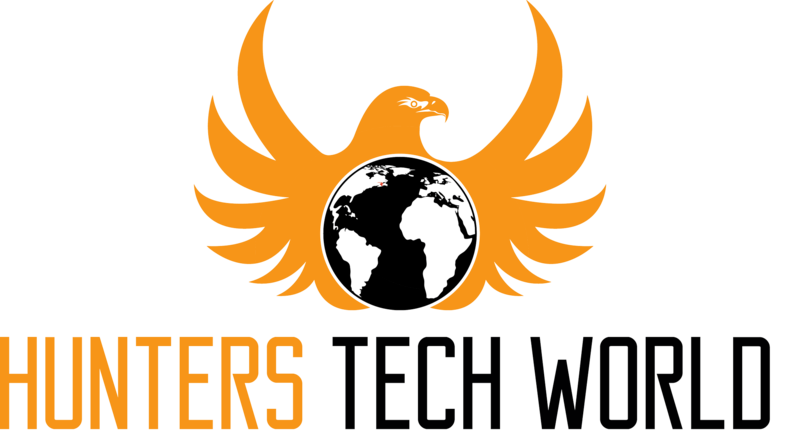 -1-year warranty only covers manufacturer defects. -Comes with a hefty price tag. -If you don't like hunting alone, this isn't your rig! -Holds hunters weighing up to 350 pounds. -Fully-padded seat, backrest, armrests and shooting rail for ultimate comfort. -Product includes one of the industry's best full-body arrest harness systems. -Design is unique; based on geometrics for stronger but simpler construction. -Platform and rig has no crossbar reinforcement. -May be too tall or small for your hunting needs. -Won't attach to trees that are over 20-inches in diameter. -Requires 3 men to assemble and install. -A dude who's addicted to shooting, design innovation and a manufacturer with a solid reputation. Admit it: This company's name got your attention, but when you read about the quality and features prized by owners of Skunk Ape Tree Stands, you'll give the brand the respect it deserves. One veteran bow hunter said that this stand changed the way he hunted from a tree. Can there be a better endorsement from someone who knows his way around a tree stand and doesn't give out recommendations or commendations lightly? -Comes with 4 hangers for stowing gear and eliminating clutter. -Swivel seat is quiet and extremely comfortable thanks to extra padding. -Ladder extends to 20 feet for optimal elevation. -Comes with 2, 25-foot bow/gun lift cords, ladder grip tape and shooting rail padding. -Chair has a safety-locking pin and seat belt, both of which up your safety ante. -Engineers tested this product for 5 years before introducing it to the market. -One of the most versatile designs on the market, it's engineered for serious hunters. -Designed to eliminate tree damage; trunk penetration isn't required. -The 25-foot safety tether is secured with a Prussic knot and carabiner. -May not be your first choice if you never shoot while sitting. -Unless you find a sale, this product isn't for hunters on a budget. -Surprisingly lightweight, you may prefer a sturdier tree stand. -Seat folds up to avoid water and refuse collection and damage. -Adjust the shooting rails to fit your torso height and achieve better aim. -Design gives you 360-degree range of motion and higher degree of accuracy. -Green design means this stand won't sustain tree sap damage. -May be difficult to locate compared to more seasoned brands. -Hard to find credible reviews by hunters because this product is so new. -You can get a comparable ladder stand for less money. 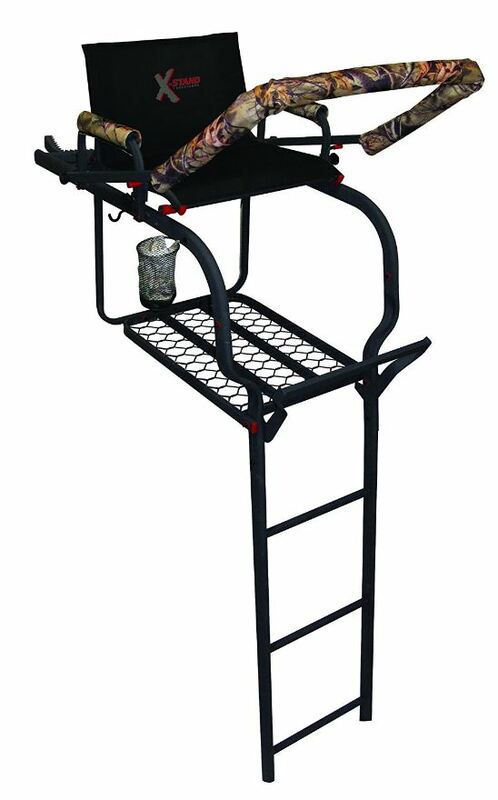 -If you hate to hunt alone, this ladder stand isn't for you. -Folks who love new products that deliver a solid hunting experience without harming trees in the process. Do I keep returning to one brand or limit my choices to narrowly-defined price points? Just ask my wife if; I always answer no to both questions. Why? Hunting product innovation moves as fast as electronics, so why wouldn't I want to sample new products on the market? That doesn't mean I don't adhere to specific guidelines borne of lousy gear purchases I've made over time. But you're the recipient of my trial and error attempts at gearing up and I pass these tips along so when you shop, you don't catch buyer's remorse, an illness I have suffered a few times myself! Scope out your location so you can decide whether you need a portable or hang-on ladder stand. Obviously, you can't just move in on someone else's turf without permission, but once you have it, make sure it's got a nice mix of tree types and circumferences. I don't have to tell you that a skinny tree could be hazardous to your health, right? I've made the mistake of going so high, I literally eliminated shooting lanes in my desire to hang out among the leaves. Every wooded area is different. If you ignore the tree canopy height because you want the tallest available ladder, you could be making a big mistake. It's okay to make camouflage part of your wilderness experience--as long as you don't think that deer can be fooled by it. Wildlife can't distinguish colors-but they are experts at spotting degrees of dark and light. The higher the contrast, the more likely you'll be spotted, no matter how high you climb. What does age have to do with bow hunting? Plenty. If you're young and inexperienced, it takes time to get used to heights and platforms. If you're older, physiological factors can impact the pleasure you get from this sport. My dad, for example, has bad knees. In his case, a 15-foot ladder stand with wide rungs is ideal. #5: Do I need a diet? You've already learned that most single-person stands carry a weight limit of 300 pounds, but when it comes to doubles, you'll have to find skinnier friends since most 2-person products top out at 500 pounds. May I remind you that you need to factor in the stand's weight? I recommend picking the amount of platform space that suits your unique needs and that may not be the biggest platform of all. You need enough room to do your thing without constantly checking your safety harness "just in case." But some platforms may not fit the environment. Small platforms for small hiding places is often the best way to go! Ladder stand types are multiplying faster than rabbits. They include tripods, portable units, ladder and climbing styles. This is the time to consult http://pickabow.com/best-tree-stand/choosing-right-tree-stand-hunting-style/ to determine which type will work best for you, whether you need a platform designed to accommodate you and/or your hunting pal. I don't have to remind you that even a bargain ladder stand price isn't worth taking a chance if it's not engineered with safety measures, do I? I came close only once--I nodded off after getting up too early--and won't repeat that scenario again! Get every safety measure on the planet, from harnesses to slip-proof steps. Even armrests can help keep you safe. No matter which ladder stand you choose, I recommend watching this YouTube video by the National Bowhunter Education Foundation (NBEF) before you start your installation: . Even if you already know it all, don't be surprised if you learn something new!